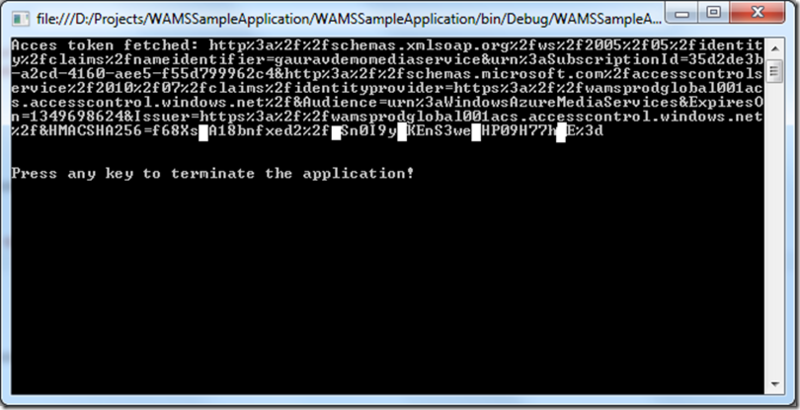 Before you start building media applications using Media Service in Windows Azure, the first thing you'll need to do is create a media service. 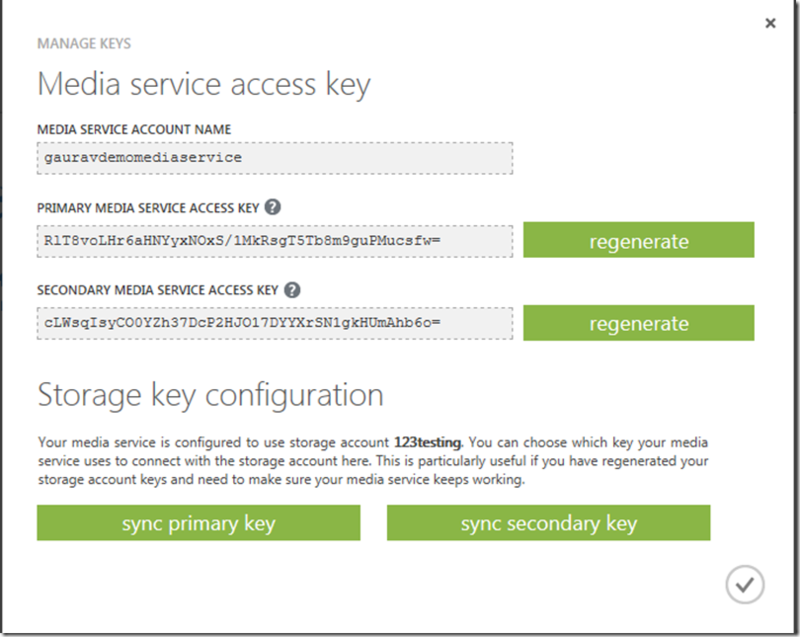 You can create a new media service through Windows Azure Portal. Following screenshots demonstrate the steps for the same. First thing you would need to do is provide a media service name and choose a storage account where files related to various assets will be stored. Once media service has been created successfully, next thing you would want is to get hold of the access keys. 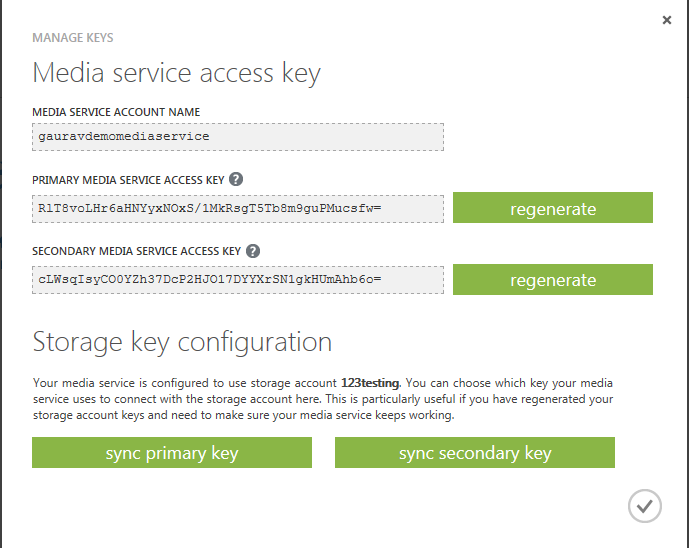 If you have used Windows Azure Storage Service, you would be familiar with the concept of access keys. Essentially these are the keys required for securely communicating with Media Service. Anybody with access to these keys (and your service name) has complete access to your media service thus extreme care must be taken to protect these keys. Based on my testing if I don’t click on any of these “sync primary key” and “sync secondary key” buttons by default Media Service make use of storage account primary key. If I change my primary key, any operation I perform which involves Media Service to interact with this storage account will fail. At the core of it, Media Service exposes management functionality through a REST API. 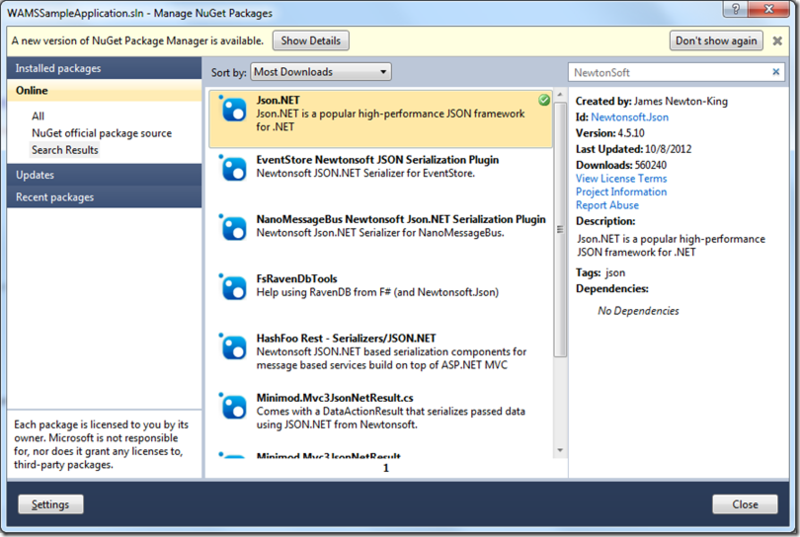 It also provides a .Net SDK which essentially is a wrapper around REST API. Flexibility: Usually in my experience, consuming REST API gives you more flexibility as you are not bound by only the functionality exposed through SDK. Convenience: Obviously SDK provides you more convenience as most of the work as far as implementing REST API has already been done for you. Plus it includes some helper functionality (like moving files into blob storage) which is not there in REST API for Media Service. Platform Feature Compatibility: In my experience, SDK comes a bit after (sometimes long after) REST API. If we take Windows Azure Storage for example, there are still some things you could not do with SDK (version 1.7 at the time of writing) while they are available in the system and are exposed via REST API. If we look at Media Service in particular, the ability to create Job Templates and Task Templates are still not available through SDK at the time of writing this blog. Thus if you need these functionality, you would have to go REST API route. SDK Unavailability: Sometimes you don’t have a choice. For example, if you’re building functionality in say PHP and we know that currently there’s no SDK available for PHP. In that case you would need to use REST API. Having said this thing and given the way things are going in other parts of Windows Azure, I would not be surprised if the SDK for many common platforms (PHP, Java, node.js) arrive pretty soon. Get an access token first: Before using REST API, you would need to get an access token first from Windows Azure Access Control Service (ACS). This is described in detail later in this blog post. Know about various request/response headers: Again when using REST API, understand about various headers you would need to pass in your request and the headers returned in response. You can find more information about this here: http://msdn.microsoft.com/en-us/library/windowsazure/hh973616.aspx. Windows Azure Storage Client Library Version: Please note that at the time of writing this blog, the SDK has a dependency on Windows Azure Storage Client Library for SDK version 1.6 (library version 1.1) while the most latest SDK version is 1.7. Please make a note of that. HTTP Method for this request is POST. access_token: This is the access token you would need when working with Media Service REST API. It must be included in every request. expires_in: This indicates the number of seconds for which the access token is valid. One must keep an eye on this value and ensure that the access token has not expired. One needs to get the access token again if the access token has expired. 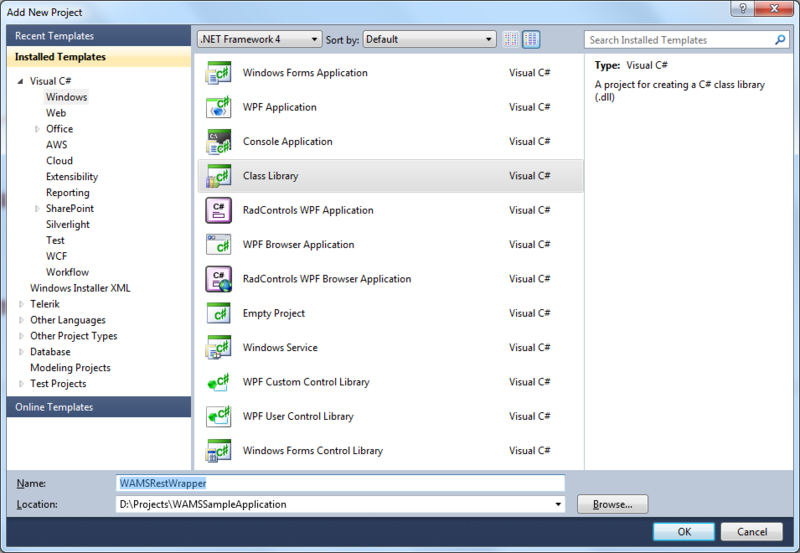 Now what we will do is create a simple class library project which would be the wrapper around REST API much like .Net SDK. Then we’ll start consuming this library in another project. 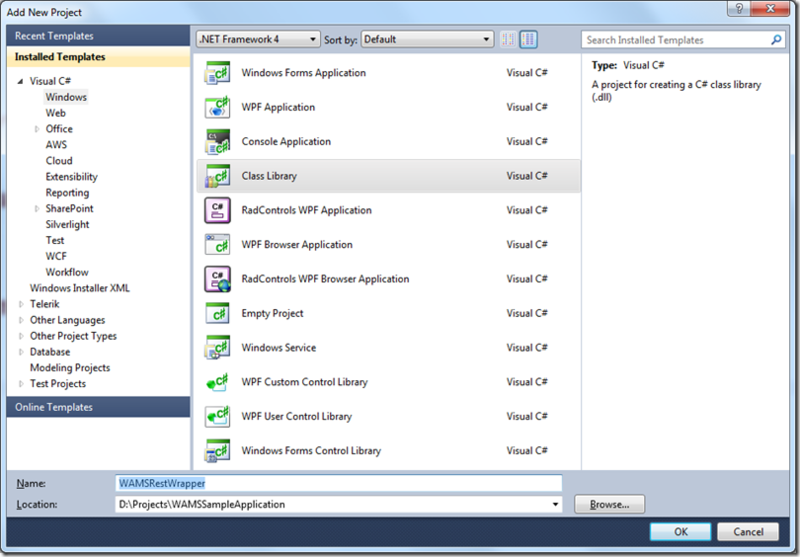 We’ll use VS 2010 to create this project and make use of .Net framework version 4.0. For the sake of simplicity, we’ll call this project as “WAMSRestWrapper”. Also because this REST API sends and receives the data in JSON format, we’ll make use of Json.Net library. Since I’ll also be learning the REST API, the code would not be the best quality code and would desire a lot of improvements. Please feel free to make improvements as you see fit. In this blog post, only thing we will do is get the access token and store it with our application. To do so, let’s first create a class called AcsToken. Members of this class will map to the JSON data returned by ACS. Next let’s create a class for fetching this ACS token. Since this class will be doing a lot of stuff in the days to come, let’s call it “MediaServiceContext” (inspired by MediaContextBase in .Net SDK) . /// Media service account name. /// Media service account key. /// it gets a new access token. /// This function makes the web request and gets the access token. /// 1. The access token. /// 2. Token expiry date/time. The code is pretty straight forward. The constructor takes 2 parameters – account name and key and it exposes a public property called AccessToken. If an access token has never been fetched in this object’s lifecycle or has expired, a web request is made to ACS and token is fetched. Now let’s write a simple console application which makes use of this library and all it does is prints out the access token on the console. Once we run this program, this is what we see on the console. Now when invoking the Media Service REST API, we will make use of this access token. That’s it for this post. In the next post, we will deal with more REST API functionality and expand this library. I hope you have found this information useful. As always, if you find some issues with this blog post please let me know immediately and I will fix them ASAP.